Monday: Shaw has cleared waivers and joined the Winnipeg organization. The team has assigned him to the Manitoba Moose for the time being, but could potentially recall him to spend some time in the NHL this season. Sunday: The Winnipeg Jets have decided to add more forward depth to their roster as they announced that they have signed Logan Shaw to a one-year, two-way contract worth $675K. Shaw, who has appeared in 180 NHL games over his career, has been playing on an AHL-contract with the San Diego Gulls. As part of the contract signing, Shaw has also been placed on waivers, according to Elliotte Friedman. The 26-year-old Shaw appeared in 72 NHL games last season between the Anaheim Ducks and Montreal Canadiens, but struggled to produce points, combining for just four goals and 14 points. He received a PTO with the Calgary Flames for training camp this year, but FlamesNation’s Ryan Pike reported that Shaw was solid, but unspectacular there. After signing an AHL deal with San Diego, Shaw has fared well, putting up two goals and five points in seven games. Even with the addition of Shaw, the Jets have only 41 players under contract, which is the lowest number in the NHL. The next lowest is both the Pittsburgh Penguins and the Los Angeles Kings with 44. So, system depth was critical for Winnipeg and Shaw, who should clear waivers, can be assigned to the Manitoba Moose in the AHL. Forward Logan Shaw has re-joined a familiar locale. The journeyman power forward, who attended Calgary Flames training camp on a PTO, was unable to secure NHL employment this season. Instead, he has signed a one-year AHL contract with the San Diego Gulls, the Anaheim Ducks’ affiliate announced. The Gulls are one of the seven different NHL or AHL teams that Shaw has played for in his five-year pro career, albeit only briefly with a pair of contests in the 2016-17 season. Were it not for the Montreal Canadiens claiming him on waivers last season, that number would be much higher. The Anaheim Ducks, who had traded for Shaw early in 2016-17 and gave him a then-career high 55 games and a contract extension, attempted to slide the big winger through the waiver wire after another 42 games last year, only for the injury-riddled Canadiens to claim him. Shaw skated in 30 games for Montreal and, combined, recorded a career-best 72 games and 14 points last year. However, that wasn’t enough to drum up NHL interest and Shaw has instead returned to the AHL level and a team in San Diego with which he has some familiarity. Shaw made his Gulls season debut last night, notching an assist in a narrow loss to the Tuscon Roadrunners. Shaw could be a leading scorer for San Diego this year and, at 26 year old, the door to an NHL return may not quite be shut just yet. The Boston Bruins have assigned forward Martin Bakos to their AHL affiliate, the Providence Bruins, the team announced. Bakos, a free agent signing out of the Czech Republic, began the season on the injured reserve after suffering a lower-body injury early in training camp. That lack of ice time with the starters in the preseason eliminated any chance that Bakos had of cracking the Bruins’ roster right away, but the team does have high expectations of the veteran Slovakian forward. Bakos, 28, has several season of experience in the KHL as well as the Czech League, including his career-high 40-point campaign with Liberec last season. Bakos is a versatile, two-way forward who can play all three forward positions and competes in all three zones. The Providence Bruins are deep with talent, both young and older, but Bakos could be one of the first call-ups if he stays healthy, adjusts to the North American game, and produces for Providence. The Montreal Canadiens have recalled goalie Charlie Lindgren from the AHL’s Laval Rocket, the team noted this morning. It is an emergency recall for Lindgren, as starter Carey Price is apparently unavailable do to the flu. The Habs square off with the Pittsburgh Penguins tonight and it will presumably be the first appearance of the season for primary backup Antti Niemi. However, given the Penguins’ scoring punch, Lindgren could also potentially make his season debut. The 24-year-old has made 17 NHL appearances in his young career, posting a save percentage of .914 and a goals against average of 2.78. With their injury-plagued parent club already drawing on their roster depth, the Belleville Senators have re-signed forward Daniel Ciampini to a two-way contract for this season, the team announced. Ottawa could prove to be a team with a fluctuating roster this season in need of AHL reinforcements, so Belleville has proactively added one of their own in Ciampini. The 27-year-old played in 49 games with the junior Senators last season, recording 16 points. The former Union College standout has also scored at a better than a point-per-game clip in the ECHL the past two years, showing some production potential that Belleville hopes spills over into the AHL. The Florida Panthers have sent defenseman Jacob MacDonald to the AHL, the team announced. MacDonald will head to the Springfield Thunderbirds, somewhat of a return for a player who briefly played for the former Springfield Falcons back in 2015-16. The MacDonald experiment always seemed to have an expiration date with the Panthers having several injured defensemen on the mend, but MacDonald did score on his first (and only) NHL shot and performed well in sheltered minutes through two games. However, the team will move on without MacDonald for now, as he looks to continue the success he found at the AHL level last season. In the meantime, KHL import Bogdan Kiselevich has been activated from the injured reserve and will likely take on a regular role in Florida. The Calgary Flames have signed another veteran forward to a professional tryout, this time bringing in Logan Shaw according to Kristen Anderson of Postmedia. Shaw finished the season with the Montreal Canadiens, but was not issued a qualifying offer and became an unrestricted free agent. Shaw, 25, was selected in the third round by the Florida Panthers in 2011 and slowly worked his way through their minor league system including a stint in the ECHL. In 2015 he made his NHL debut and played 53 games for the Panthers, lining up mostly on the wing. That was the last chance he’d get in Florida though, as he was traded to the Anaheim Ducks during the 2016-17 season to the Anaheim Ducks and became a part-time NHL player for them. In 97 games for the Ducks over two seasons, Shaw recorded 18 points and showed that he could play center in a pinch. When his role with the Ducks diminished and he was put on waivers this past season, the Canadiens claimed him and used his versatility to fill out the bottom of their roster. Scoring six points in 30 games with Montreal, Shaw actually saw the most ice time of his career. That didn’t earn him a contract though, and he’ll be hard pressed to fight his way onto the Calgary roster. Already the Flames had several players battling for fourth line spots this season given their additions further up the lineup, and it’s hard to see any inside track Shaw might have. Still, he’ll be able to showcase his skills and prove that he still belongs at the NHL level somewhere around the league. 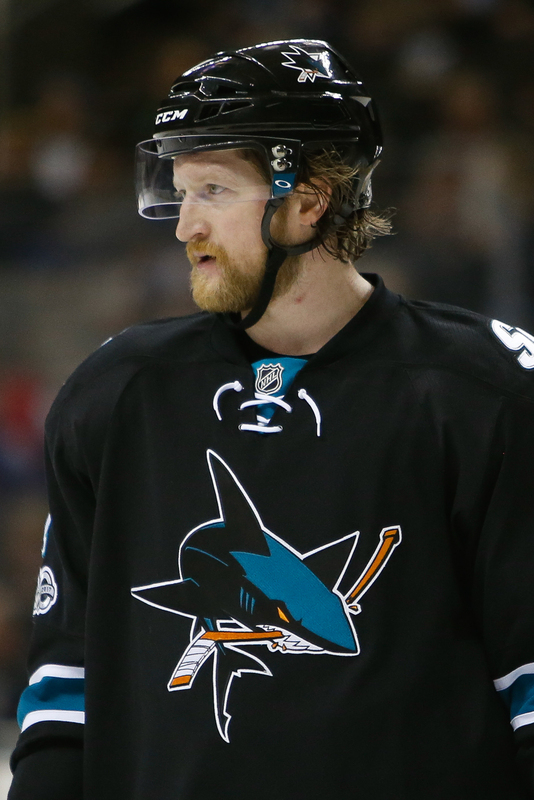 The early reports were true, and Paul Martin has indeed been placed on waivers by the San Jose Sharks according to Pierre LeBrun of The Athletic. LeBrun also notes that the Montreal Canadiens have claimed Logan Shaw off waivers from the Anaheim Ducks. Martin, 36, has had a rough season as he battled through injuries and a lack of playing time. The Sharks have seemingly moved on from him, and are currently looking for a trade partner to give him another opportunity. While a waiver claim could certainly offer that, it’s more likely that he goes unclaimed and heads to the San Jose Barracuda to try and rebuild some value. His $4.85MM cap hit this year and next is a real impediment to any team that is interested, and any deal right now would likely have to include some degree of salary retention. If Martin does clear, and immediately starts to play for the Barracuda, there is obviously still a place for him in the NHL. The veteran defenseman recorded 26 points and more than 19 minutes a night just last season, and has been an effective stay at home counterpoint to Brent Burns’ roving nature in the past. It’s important to note that both the Minnesota Wild and Toronto Maple Leafs are at the 50 contract limit, and would need to move out a player in order to make a claim or acquire Martin in trade. Shaw on the other hand was just waived by the Ducks after they claimed J.T. Brown from the Tampa Bay Lightning, and now finds his way to Montreal to help their forward depth. The 25-year old has eight points in 42 games for the Ducks this season, and provides some size—though not a ton of physicality—for the Canadiens to insert into their bottom-six.